Christine Lovly, M.D., PhD., is a physician-scientist with a special interest in thoracic malignancies. Dr. Lovly’s clinical practice focuses primarily on the care of patients with lung cancer. Her laboratory research is directed at understanding and developing improved therapeutic strategies for specific clinically relevant molecular subsets of lung cancer. She received a B.A. in chemistry from Johns Hopkins University followed by M.D. and Ph.D. degrees as part of the Medical Scientist Training Program at Washington University in St. Louis, MO. She then completed internal medicine residency and medical oncology subspecialty training at Vanderbilt University. During her final year of fellowship, she was the Jim and Carol O’Hare Chief Fellow. 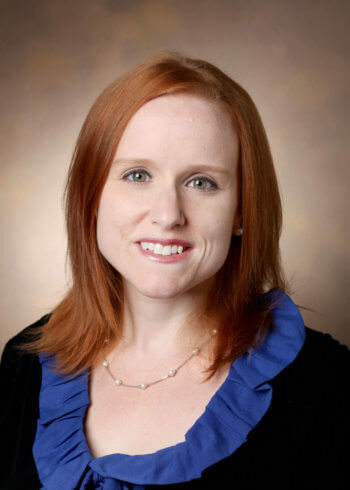 She started on faculty at Vanderbilt in the Department of Medicine, Division of Hematology-Oncology in July 2012. Dr. Lovly was chosen for the Class of 2017 of the Lung Cancer Foundation of America/International Association for the Study of Lung Cancer Lori Monroe Scholarships in Translational Lung Cancer Research. She is the author of several peer-reviewed scientific manuscripts, and she is an active member in the American Society of Clinical Oncology (ASCO), the International Association for the Study of Lung Cancer (IASLC), and the American Association for Cancer Research (AACR). She is also deputy editor for the website My Cancer Genome, a Vanderbilt initiated, freely available website which aims to provide health care practitioners, patient, and advocates with up-to-date information regarding genetically informed cancer medicine. Dr. Lovly’s LCFA-funded research involves small cell lung cancer. Here she discusses her research, and what the LCFA research funding means to researchers like herself. Have you been diagnosed with small cell lung cancer? The most important thing you need immediately is information! Educate yourself on small cell lung cancer today!